In the Rieckhallen of Hamburger Bahnhof there is an exhibition of musical scores by visual artists. You might know the Rieckhallen as that eternally long hall that takes two hours to walk and then two hours to walk back to the exit. This sounds as exhausting as it is. Now I finally know how to make the Rieckhallen better. You see, in this exhibition some walls have been taken down. Chris Markley, for instance, is shown in a huge space with just two projections. It got me totally excited. That’s it, I thought. Those walls dividing the Rieckhallen into even, stiffening spaces have to be teared down. Turn the Rieckhallen into one huge space with maybe only 2 to maximum 3 separating walls. It will make the space magnificent and the art work will be able to breath. The categorisation of modern art and contemporary art is questionable, as we all know: where does the former end and the latter begins. But it is totally justifiable when you look at its audience. Take the current Kirchner exhibition at the Hamburger Bahnhof. The show attracts a totally different (older) audience that’s into modern art, but doesn’t like contemporary art at all. That the Kirchner exhibition takes place at the museum of contemporary art, leaves most of them cold. It makes me wonder if in thirty years time, I’ll be visiting exhibitions of whatever survived from the early 2000s and avoid, let’s say, the art of the mid 21st century. Probably I will. 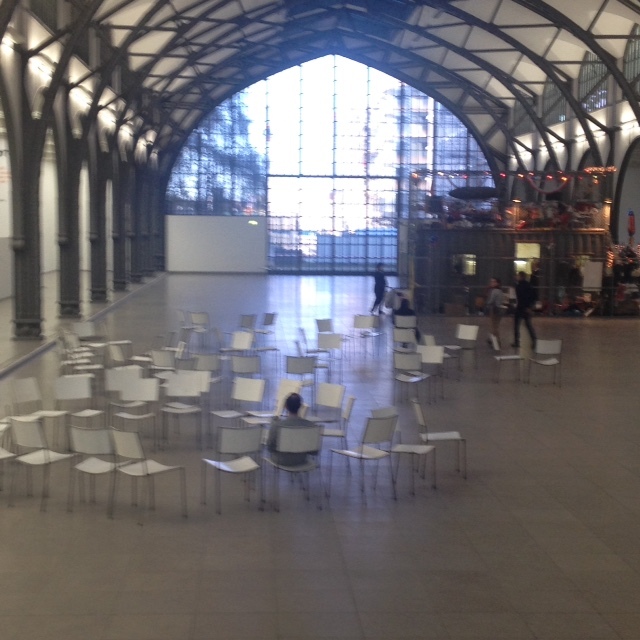 At the moment there are Franz West chairs shown in the Historical Hall of the Hamburger Bahnhof. You can see that they’re not design chairs and they're also not normal chairs, so the conclusion is they must be art chairs. Then you still don’t know if you’re allowed to sit on them. When giving guided tours it’s the first thing I do with my group. We sit on the chairs, and then we go and look at this new constellation of chairs from afar. The sight of this fleeting temporary togetherness warms the heart. It's only a pity that Christopher Büchel’s container of the 2000s USA selection is also in the same space. Nothing against Büchel, but the Franz West’s chairs on their own in this beautiful hall would have been such a splendid sight. It would also have visualised a radicalness that no other huge spectacular art show could ever top: give people space, give people a chair to sit on!